Sept. 29, 2011, 8 a.m.
By Martin Langeveld @MartinLangeveld Sept. 29, 2011, 8 a.m.
How have things turned out so far? What might the results have to do with Amazon’s new tablet? And, most importantly for the Nieman Lab audience, what new disruptive challenges does all this throw at the elusive and precarious business models for news? 60 percent of all tablet owners have used the devices for shopping. 20 percent of all mobile commerce sales is now happening on tablets. Total mobile commerce will reach $10 billion next year (although Forrester’s trend line is conservative compared to other forecasts). Social: Tablets are mobile, so people have access to them at more hours and more places than their PCs, particularly in social situations. Having a drink after work and somebody mentions a product you might like? You’re not going to unpack your laptop, but you’ll check it out on your smartphone or tablet. And you probably prefer the tablet because of the screen size and ease of use. Graphics: Tablet screens are better than PC screens (on average), so illustrated merchandise and services look better. Plus, tablet shopping can happen via apps not available on PCs, and those apps generally present merchandise and services with more compelling graphics than websites do. Psychology: Tablets with touchscreens are more tactile than PCs, so psychologically the experience of shopping on a tablet is closer to in-store shopping than PC shopping is. This means merchants need to rethink site design to optimize for touch navigation rather than mouse pointing and clicking (as the WSJ article above mentions Macy’s is doing). Demographics: For now, at least, tablet ownership is skewed toward higher-income demographics, meaning that tablet owners have more disposable income. Time: Tablet ownership increases consumers’ total time online, which makes them more predisposed to online shopping (and reduces the time they have available for in-store shopping). 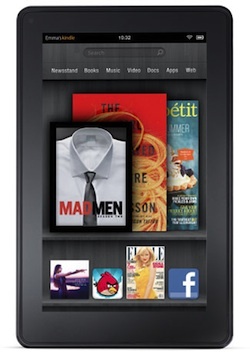 Which brings us to the Kindle Fire, the new $199 tablet announced yesterday by Amazon CEO Jeff Bezos. Amazon, of course, is a selling machine, and Bezos and his crew are no doubt keenly aware that the tablet is turning out to be a buying machine — a match made in heaven. With a price that’s most likely below Amazon’s cost of production, clearly the company expects the Fire to drive an enormous new revenue stream by serving as a more direct, more effective conduit to its consumers — one that can reach them (as outlined above) with sexier sales pitches at more hours of the day, in more social and leisure situations, and with greater predispositions to buy. In other words, it’s all about the shopping. So get the popcorn ready for what will be a fascinating asymmetrical fight between Apple and Amazon (and, as side shows, between Apple and Android and between Amazon and Netflix). Besides Apple and Netflix (which will be impacted by the video streaming that comes with the Prime membership — and at a much lower cost than Netflix’s recently hiked prices), who else will see their business model disrupted by Bezos & Co.? The advent of the Kindle Fire will impact every business engaged in advertising, from your local weekly newspaper to Google, Yahoo, Microsoft, AOL, and Groupon, because it will vastly accelerate the transformation to direct-to-consumer marketing by merchants, manufacturers, and service providers, without the traditional interpolation of advertisements to drive buyers to sellers. This is a long-term transformation; it won’t happen overnight and it won’t kill those impacted businesses overnight. They may have time to innovate, to find ways to adapt. But it clearly means that news publishers, who dream about finding the holy grail of an ad-supported business model that works for online news, must change their thinking. First, the 80 percent rule. The tablet is one hot item, and before long “everyone will have one.” Even though right now only 9 percent of consumers have tablets, we can now predict with confidence that eventually, tablet penetration will reach 80 percent, and the Fire will accelerate progress to that level. Why 80 percent? Because that’s the saturation level for every new digital breakthrough. First, PCs in the US have approached a household penetration of about 80 percent, and have leveled off there. The same goes for Internet penetration (actual connections, everything from dial-up and north), which is approaching the same level. Broadband penetration (actual connection, not accessibility) is still somewhere in the 60-percent range, but is also trending toward reaching and leveling off at close to 80 percent. Cellphone are used by over 85 percent of adults, and smartphones will hit 45 percent this year or next year, on their way to 80 percent or more. So with tablet penetration now at 9 percent just 18 months after the first shipment of the $500 iPad, I expect tablets to hit 80 percent within five years, if the price is right. And the price is now right. At $199, Amazon is delivering a robust tablet and making it affordable to a lot more consumers than the elite-oriented iPad (with its stratospheric $500 starting price). Fire is priced in the same range as a lot of smartphones (if you were to buy them for cash rather than getting them free as part of a contract commitment). The price will be seen as accessible by a lot of folks and will likely go on their Christmas lists. Maybe on 80 percent of Christmas lists. So imagine a world (or at least a US), not too far off, in which 80 percent of consumers are carrying around a tablet of some kind, a big fraction of which (I’m going to guess half) are Amazon tablets. And imagine you’re a Main Street merchant, restaurant, bank, or car dealer — in other words, you’re the traditional funder of local journalism via the tithes you pay to the local newspaper, radio station, or hyperlocal publisher for your ads. (a) Continue to try to reach consumers through the traditional mix of local print, radio, and TV media, plus their affiliated web sites? (b) Try to reach consumers where they’re spending most of their digital hours — on their tablets surfing the web, social networking, texting and emailing, shopping via apps, reading books, watching video, listening to music, playing games? Cheap but robust tablets will have built-in means of delivering advertisements during nearly all of those activities — because that’s the new bargain offered by Amazon. “A service, not a tablet.” Amazon’s giving away the razors in order to sell the blades. Besides books, movies, and music content, Amazon’s service will include ads, including local “Kindle Special Offers,” Bezos said during yesterday’s announcement. (c) Figure out how to reach your consumers directly, or allow them to reach you directly, via a shopping app or HTML website, and via social recommendations? Obviously (a) is a non-starter, so you’re going for some combination of (b) and (c). And that’s where the challenge as well as the potential opportunity for news publishers lie — but to be a player in either channel, the change from traditional advertising is like night and day, and the challenge of transforming news businesses to adapt to them is huge and daunting. Newspaper publishers have actually tried to anticipate some of these challenges, but their reactions have mostly been too little, too late. For example, they recently announced an initiative called iCircular, an effort to create the digital equivalent of preprints — newspaper advertising inserts — in the form of an iPhone app. What else can news publishers do? Let me offer an update of the tablet strategies for publishers I offered early last year at the dawn of the tablet era. Embrace the mobile web and the tablet. The slim opportunity for publishers here is to lead their audiences, rather than belatedly to follow them. Go beyond Digital First; move to Mobile First. This is very hard for newspapers because, honestly, most of them are still mainly Print First, slogans notwithstanding. And traditional publishers are going to be up against nimble, mobile/tablet-native startups. Even web-only hyperlocals need to adapt, shifting from Web First to Mobile First. Reinvent content for the mobile web and tablet. To do this, publishers need to invest in new, innovative design capabilities. This is hard, too, because it means actually spending more money on news. But it’s critical, because it’s going to be critical to build a mobile/tablet audience for news. The good news is that tablet users spend more time on news than PC users; the challenge is to attract and keep their attention. Challenge journalists to develop new streams of content, in new formats and with new kinds of interactivity that will attract new readers and build new relationships of trust with them. As part of that, publishers and journalists may need to establish separate identities, with journalists building up their own brands, and publishers serving as curators and aggregators of content from many sources. Be ready to shift gears often. The job is not just to create a presence on tablets, but to adapt to the new mobile landscape as it develops and changes. Like the saying goes about the weather in various localities (and as today’s Amazon announcement shows), if you think you have your tablet strategy figured out, wait five minutes. POSTED Sept. 29, 2011, 8 a.m.
Langeveld, Martin. "Amazon enters the tablet battle: It’s all about the shopping." Nieman Journalism Lab. Nieman Foundation for Journalism at Harvard, 29 Sep. 2011. Web. 20 Apr. 2019. Langeveld, Martin. "Amazon enters the tablet battle: It’s all about the shopping." Nieman Journalism Lab. Last modified September 29, 2011. Accessed April 20, 2019. https://www.niemanlab.org/2011/09/amazon-enters-the-tablet-battle-its-all-about-shopping/.